Where to begin with this cake…? I made this cake on New Years day (yep, that’s five months ago, I know ?). It was something I made completely unplanned, on a whim, just because I felt like I needed to go bake something (one of those moods). 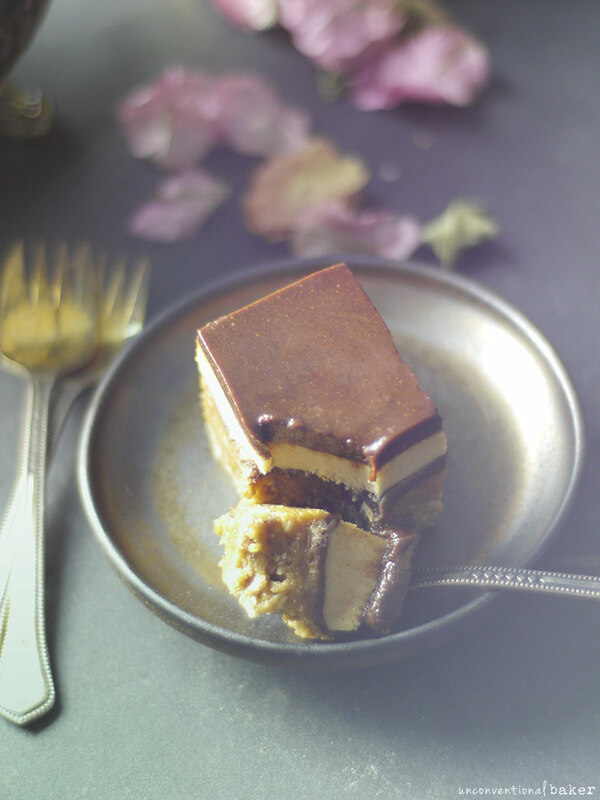 I was not intending this recipe for the blog, or for any other purpose really, so I just improvised the whole way through and ended up with these INCREDIBLE creamy, dreamy, rich, and full-flavored raw espresso layer Slices-O-Joy. 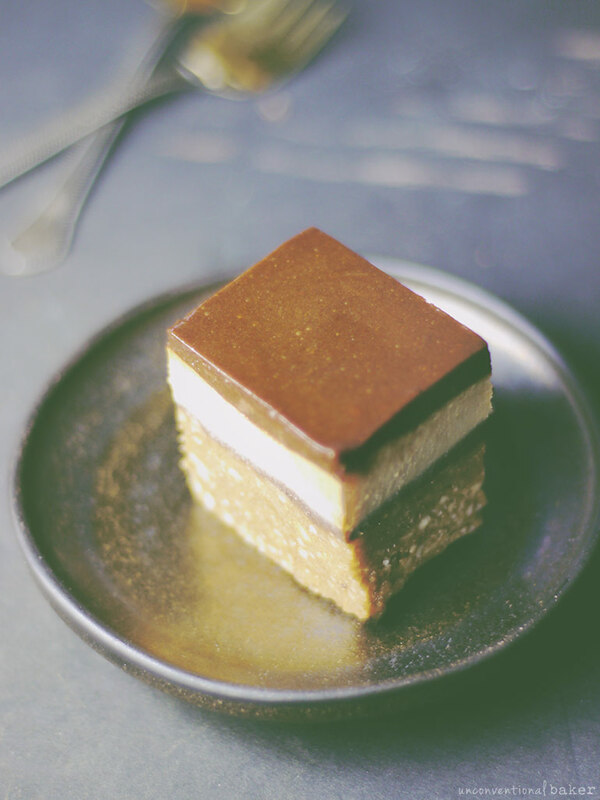 I think in my mind I had something like an opera cake envisioned as the end result, and while this certainly isn’t an opera cake, it’s equally decadent and delicious. 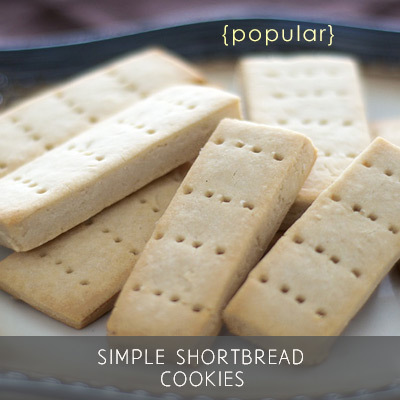 When I took my first bite, I knew this recipe was destined to make people happy. But, darn it! No ingredient measurements were taken… So I quickly jotted down some notes from memory, and snapped a few photos of the slices that were not served up yet. You might be able to see my hazy mood from the few pics I managed to capture of this cake..
Improvization is one of the most important things in the creative process for me, and perhaps that is why this cake turned out so good. I made this without any “pressure”of keeping certain things out–like having this contain no nuts, or no grains, keeping the ingredients short, etc. So without trying to make this “free” from certain common allergens, they all ended up in this recipe! 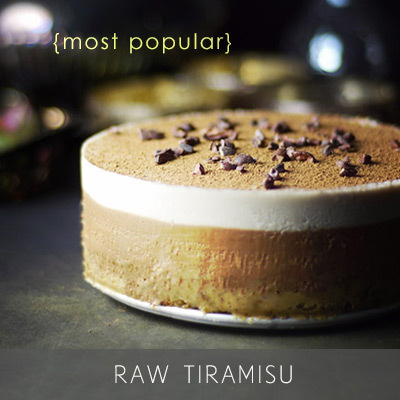 (Although of course there’s still no dairy, gluten, and refined sugar…just sayin). Oh yes, coconut found its way in here too! And it has espresso…so probably not the best recipe for kiddos. The first time around I made it in a small rectangular tupperware container with tall walls. The second time I made (to figure out exact measurements) it was in a tall round 6″ springform pan. Both worked great — so the shape of the cake is up to you. Just make sure the container you use is tall enough to fit it all in :) (at least 2½”). 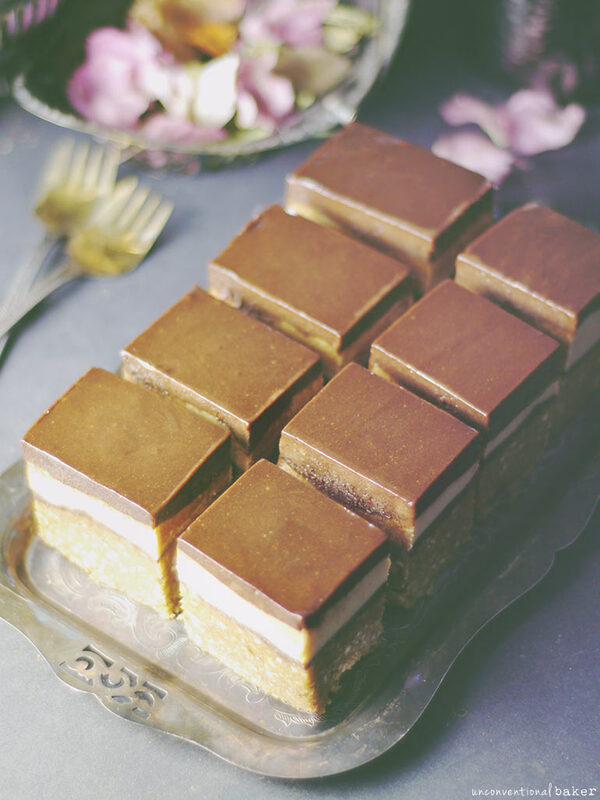 Also as a side note, while I love, love, love the look of the little square slices, you do have to trim the uneven edges off so you lose some of the cake (well not lose, but, ya know…), whereas in the springform pan you get to keep it all intact. 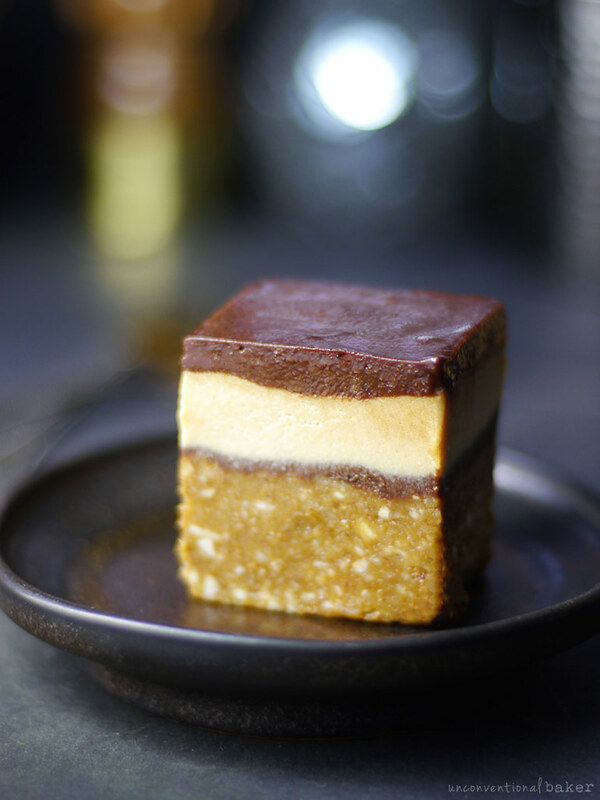 Layers of chocolatey espresso and cream meld together in this vegan, gluten-free raw espresso cake. Have a 6″ springform pan handy (or line a similar-sized tupperware container with tall sides with some parchment paper for square slices) and set aside. Process all base ingredients into a uniform mixture. Transfer into the prepared pan / container and flatten into a smooth base layer with the back of a spoon (I like to cover with a small piece of parchment paper and press down with a flat-bottomed object to make the layer top smooth and even). Freeze while working on the next step. Blend all cream layer mixture ingredients until smooth. Transfer into a separate bowl and set aside. Add all chocolate layer ingredients to the blender and blend until smooth. Assembly: pour 1/3 of the chocolate mixture over the prepared chilled base layer. Tap down to smooth out. Return to the freezer for about 20 mins to set a little. Then carefully evenly spoon the cream layer on top. Tap down on the counter to smooth out, and freeze for another 20 mins. Top with the remaining chocolate mixture and freeze once again for 5 hours or overnight for the cake to set. Allow the cake to thaw out bit before slicing and serving. Enjoy! Keep leftovers frozen. 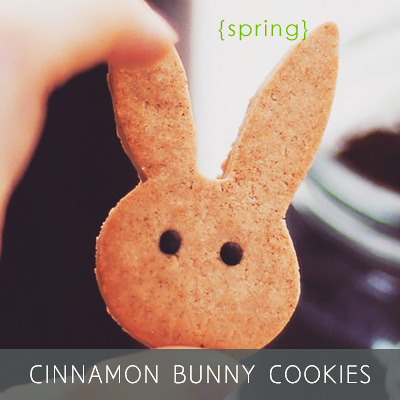 Disclaimer: this recipe contains an affiliate link to the 6″ springform pan, coconut manna, and instant espresso powder I used. * Base layer — coconut oil instead of coconut manna is not a problem. Just make sure your coconut oil isn’t liquid, or otherwise let your layer freeze a touch (a few minutes) to harden before adding the next layer. * Chocolate layer — coconut oil instead of butter is not a problem. So it’s really the cream layer I’d be worried about in terms of modifying, but I think if you can do the above or something similar you’re good to go. Thank you for the quick and detailed reply ! I have not found the coconut butter yet so I think I will give it a try using the coconut oil..
Sure thing. Would love to hear how it turns out for you with the substitutes. Enjoy it! This has a lot of coconut in it. I’d say it depends on who you ask :) I’m generally desensitized to most coconut so I don’t usually notice it as much. My husband normally hates coconut with a passion, but he didn’t notice it in this particular dessert (phew!). I feel though that if you’re not really into it or are overly sensitive to the flavor, this might be a bit noticeable. Wouldn’t want you to go through the trouble of getting all the ingredients only to find out it’s too coconutty. We have an almond allergy in our house but cashews & walnuts are fine. 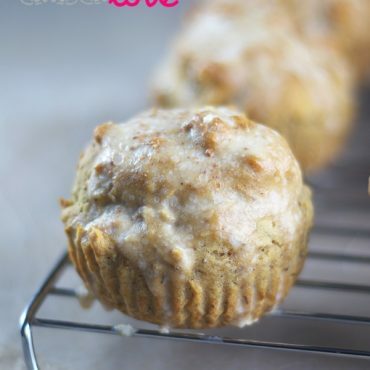 What other flour could be substituted for the almond flour? I’m assuming I could use any nut butter for the almond butter. They sure look delicious! 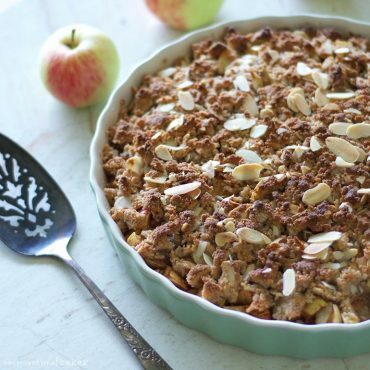 Hi Tricia, cashews and cashew flour would work great in this recipe in place of the almonds. Walnuts would work great too, but they’ll lend a stronger nutty flavor (whereas cashews are naturally more mild). And yes, another nut butter, like cashew, etc., would be just fine. No worries. If you can’t find it, you can always grind your own (just process nuts in a food processor into a flour consistency — it doesn’t have to be superfine for a recipe like this, so a homemade version will work great). Audrey, these were sooo insanely delicious! 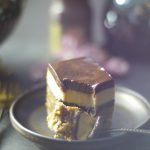 I could stop licking my spoon when I made the chocolate layer, it’s THAT good! 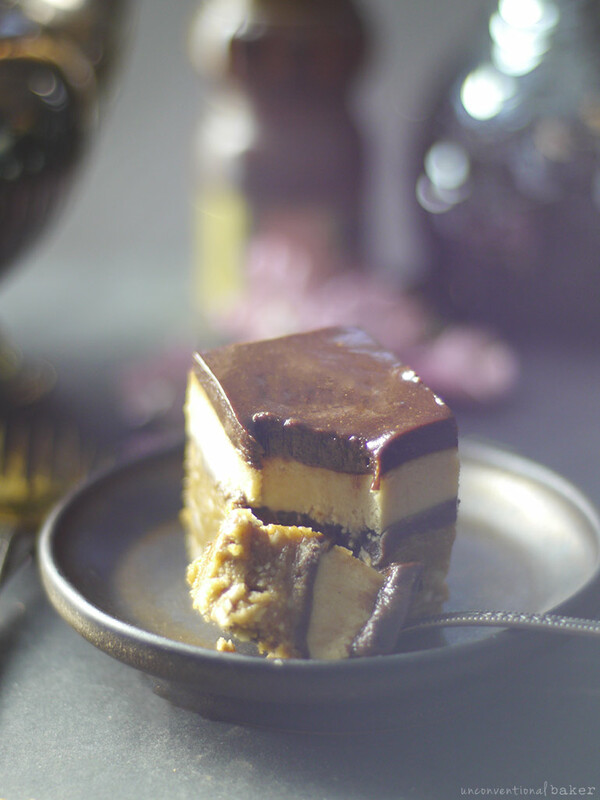 Thank you for this amazing no bake dessert! ? So i ended up making my own like this…. I also topped the cake with a thin layer of coconut oil, raw cacao, date mixture. Was great! Thank you! Oh, that’s a great idea, Jodi! Thank you for sharing and good to know about that option — never thought to make my own. OMG! That list of ingredients makes me crazy, Audrey! It sounds and looks fabulous! Haha. Nothing-free everything full just gave me a few interesting visuals ? But yes, sometimes free flowing ideas make the best things… I only wish I knew in those moments to just write things down anyhow just in case… I always lazy out and regret it later. 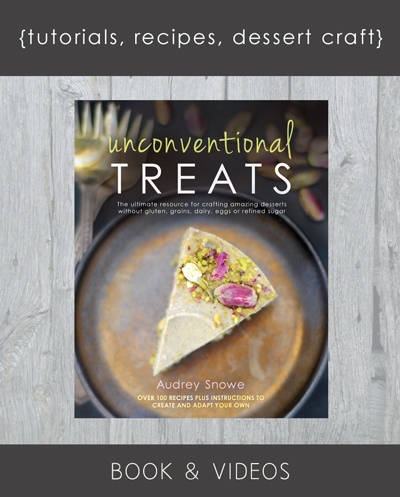 Hi Audrey, thank you for sharing your amazing recipes! I have one question; what kind of espresso powder do you use? Hi Cathrine. I used Nescafe this time, but I also love King Arthur’s. Anything similar will work just fine. Could u answer my replies on here, please? Will do :) Just working through all the questions now. Hi Alessandra, I already responded to your questions about that cake earlier on.